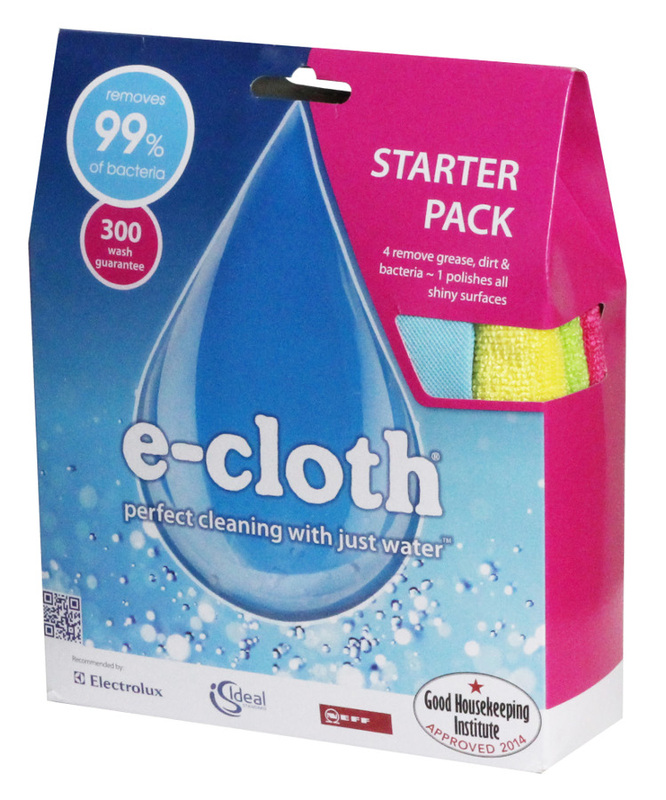 The E-Cloth Starter Pack includes four different coloured General Purpose Cloths for different areas of the home, and one Glass Cloth. The E-Cloth Cleaning System offers a simple, yet highly effective environmentally friendly way to clean the whole home. The cloths will clean even the thickest grease and dirt from all hard suurfaces including stainless steel, glass, chrome, granite, plastics, mirrors, marble, hard wood and laminate flooring - all just using water. The secret of the E-Cloth is that instead of simply pushing dirt along, it collects it on the wedge shaped fibres. Each fibre cleans by breaking up and absorbing dirt and grease into the material. The natural cleaning effect of the fibres means that only water is needed to clean all hard surfaces. The E-Cloth Starter Pack product ethics are indicated below. To learn more about these product ethics and to see related products, follow the links below. First time I've tried e-cloths and they do work well. Need to wash them every day/ other day to stop them getting smelly if they remain damp. There are currently no questions to display about E-Cloth Starter Pack. 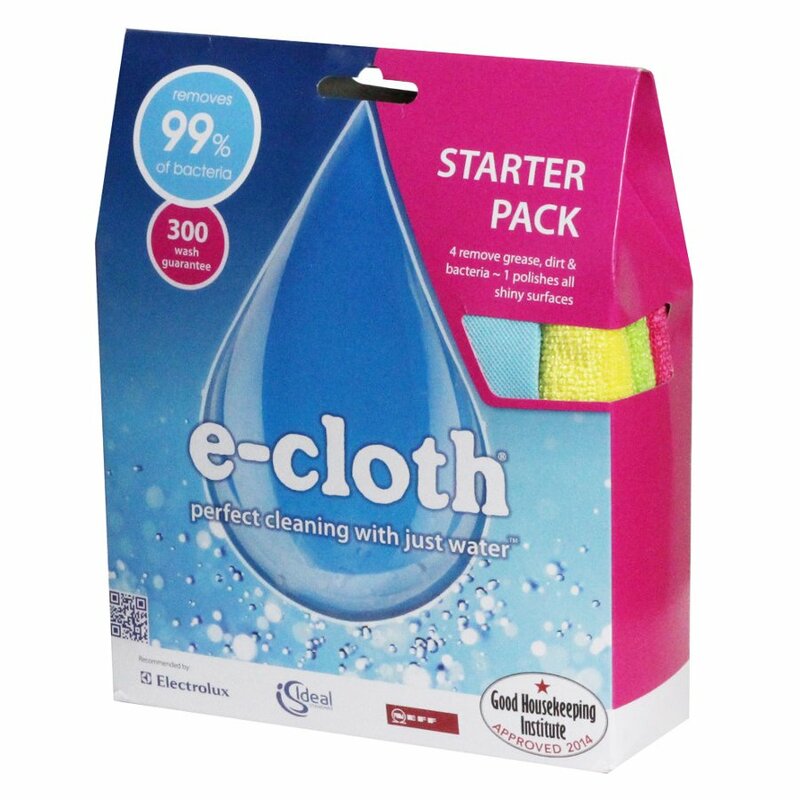 E-Cloth is a revolutionary cleaning system which can reduce your use of chemicals by up to 90%! This clean, green alternative to chemical cleaning is great for allergy sufferers and can give your home a sparkle without the use of harmful chemicals. E-Cloths are made up of millions of clever little fibres which love dust and cleaning your appliances, and leaving them naturally clean and gleaming.